Meridian has always had a reputation for thinking outside the box, dating right back to the strikingly original 104 series amps. More recently, Meridian is compatible with MQA, which in case you haven’t heard, rolls a higher bit quantity into the noise floor of an existing CD or streaming service, to get in the phrase used in the BBC spoofW1A– ‘More for less’! The other benefits of MQA, which seem particularly appealing to music producers and musicians is the notion that what the end user hears bit-wise is exactly the same as the recording engineer has signed off on. MQA was started by Meridian’s co-founder, Bob Stuart, but separated from Meridian in 2015 and runs as a distinct business entity. When the MQA light on the receiving MQA compatible DAC goes on, you know you are getting the whole truth and nothing but the truth. There are different levels of unfolding, a standard DAC can get the benefit of the first ‘unfold’, when played from a PC or Mac using the appropriate player – Audirvarna in the case of Mac. However, to release ‘the full Monty’ that MQA has to present, you will need an MQA compatible DAC. Enter the Meridian Ultra, a £15,000 offering, fresh from the Meridian stable. On seeing this chunky black box, my son asked why the new printer, was sitting next to my valve amp! 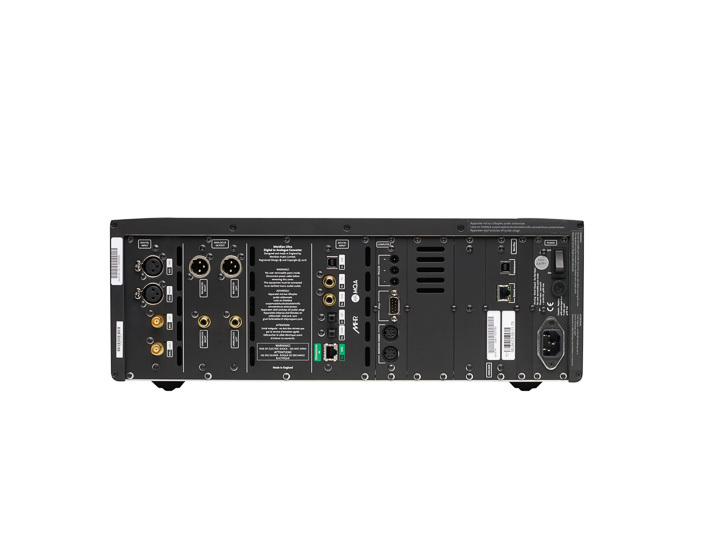 The DAC’s array of outputs covers the usual suspects, balanced and unbalanced outputs driven by four 192kHz converters; inputs comprise two BNC, coax, optical, AES, a USB 2.0 input as well as a Ethernet connection for Meridian’s Sooloos system. There’s no analogue input, which means that using the Ultra as a preamp excludes analogue sources. The power supply is a good old-fashioned linear affair, which normally emits less noise into the surrounding audio eco-system. The front panel has an electrically quiet static dot-matrix display, there are controls for source selection, DSP with a choice of three filters: short, with fewer stages of processing to provide the best time response thereby creating the most accurate soundstage, medium, and long, which has more filters and a steeper response while lessening some of the artefacts caused by pre-echo, said by Meridian to be more musical. The display can be altered from the front panel to show sample rates and other relevant information. An elegant and solid remote control exudes the build quality of the rest of the product, giving comprehensive control of the DAC. My first curiosity with this particular DAC, is how it sounds when fed with a more standard source than an MQA file. This doesn’t necessarily let the DAC play to its strengths, but gives a real-world picture of its talents. Listening with the dCS Network Bridge/USB hard disc as a source to the LSO live recording of Brahm’s Second Seranade - last movement, Bernard Haitink and the LSO, it is clear from the get-go that this is a DAC of substance and refinement. The presentation of this fabulously made recording is engaging musically, and has a timbre which is far closer to the mellow than the harsh. The sound of the orchestra is a very beautifully beguiling one, not the last word in analytical detail, but warm and rich. Chocolate cake – sachertorte, not a low-calorie healthy alternative!